PRO STREET 200 Frame Harley softail frame chopper bobber. 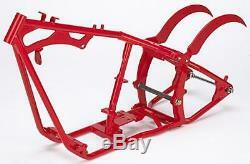 ULTIMA AUSTRALIA 1/8 pioneer ave thornleigh nsw 2120 200 Softail Prostreet Frame. SOFTAIL® STYLE / RADIUS STRUTS / WIDE DRIVE 200. Parts are Raw and not powdercoated. WE CARRY most of THE PARTS TO BUILD THESE BIKES. FEEL FREE TO GIVE US A CALL TO DISCUSS YOUR NEXT BIKE BUILD. WE CARRY THE LARGEST AMOUNT OF FRAMES IN THE COUNTRY. NOTE PHOTOS ABOVE OF A SIMILAR BIKE (GENERIC PHOTO FOR INSPIRATION). He who hesitates misses out!! A new revelation of the Ultima Product Line. Auctiva offers Free Image Hosting and Editing. The item "PRO STREET 200 Frame Harley softail frame chopper bobber" is in sale since Friday, July 20, 2018. This item is in the category "Vehicle Parts & Accessories\Motorcycle Parts\Classic, Vintage Parts". The seller is "ultimaaustralia" and is located in Thornleigh, NSW. This item can be shipped worldwide.